After attending Catholic Masses for about 4 months, I had gone to a pot luck meal at the priest’s home with my friend Erin, and her Mom. Not knowing anyone, we kinda slinked in the corner and kept to our selves. There was a puzzle sheet the priest asked us to fill out, kind of a trivia sheet. I knew lots of the questions, as I had studied the Catholic Faith. I got 8 out of the 10 questions right, and a lady came up to me and said I should be a priest. I said ” um, no thank you”- what was I suppose to say, ” hell ya! Where do I sign up?” She kept pestering me about it and how her son got the call to be a priest. I said ” oh, if God called, he didn’t let it ring long enough, or didn’t leave a message.” She didn’t think this was too funny, But then she got the priest over there, trying to convince me to be a priest. He asked me if I was interested, but I really wasn’t. I stated, ” I’m not even Catholic.”- The look on the priest face was worth a thousand words. He told me about the RCIA program to become a member of the Catholic Church, and he would contact me when it was starting up. Long story short, it started that November. At first, I did not like the teacher that we had because she seemed like I knew nothing and had to be retaught everything, but after a while, I really began to like her, and was excited to go to class to learn more. Kris, Erin’s mom was my sponsor for all of it, and came to the classes. We asked the teacher so many questions about life, and we had fun doing it. If you aren’t willing to do the classes and the rituals involved, you aren’t dedicated. There were lots of classes, lots of reading, lots of prayers, lots of rituals and meetings. 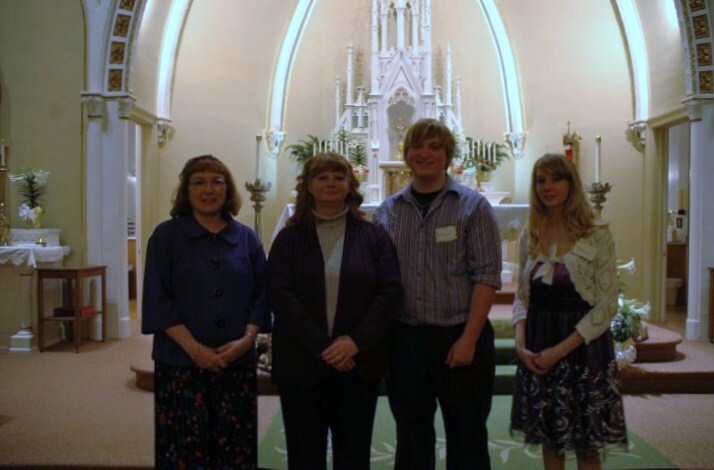 We had to go to Our Lady of Lourdes, De Pere, one Sunday afternoon to meet the Bishop, had three scrutinies in front of church, and then it all came down the Easter Vigil when I would be accepted into the church. Erin was raised Catholic but the family had slipped away from church attending and fell out of the classes. She had her First Communion, and then stopped going to CCD. After I decided to become Catholic, she decide that she would get confirmed, so on April 3rd, 2010, we both were confirmed in the Catholic faith.I also recieved my First Communion. 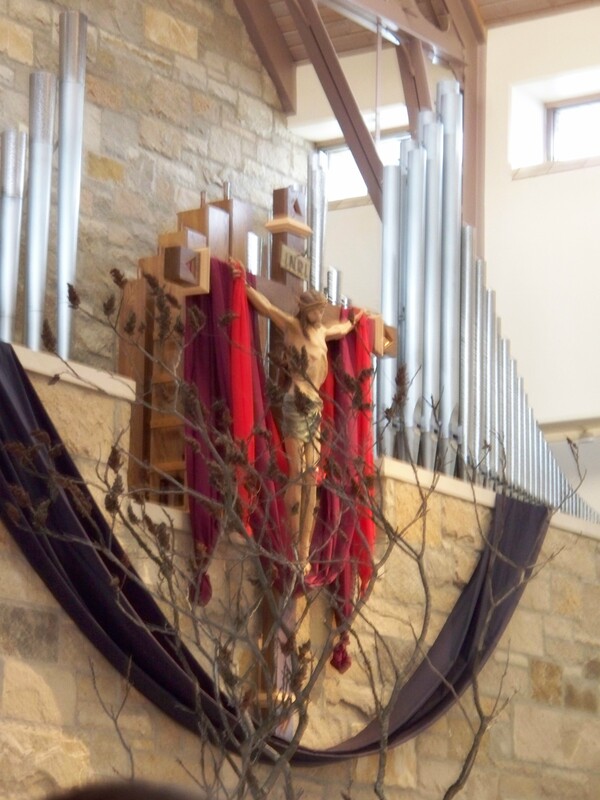 I received Reconciliation the week prior at St. Mary of the Angels. When I received Communion, the feeling I had was a once in a life time experience. I actually felt Jesus’ presence within me. I finally had received him in me, both body and blood. I felt so connected with God at that point, that I don’t know how to express it. I had taken Communion in the United Methodist Church, but it was bread and grape juice, no belief that Jesus’ was present. Since my Confirmation, I’ve had many trials of faith, and at first I was not ready for them. A customer asked me one day why I wore the cross necklace ( Confirmation gift from Kris, my sponsor)- If I wore it for religious meaning, or just because. I said about it being my confirmation gift, and explained the story. He then began harassing me for my beliefs, why I believed in prayer to Mary, the Pope, the Rosary, the Saints, Mary’s Assumption, Mary’s Virginity, Good Works, and everything there was. I could not answer him, I was stuck. I knew I believed in them, but didn’t know why. After I got away from him, I thought I had made the wrong decision, was the devil trying to stray me away from God? Was the Catholic Church the wrong choice? All these things went through my head. Now, I have studied even more about the faith, can finally back up alot of my beliefs with scripture, and do not regret my choice one bit. There are minor things I disagree with the church on, but nothing that would make me change again. I now teach 6th grade Catechism at the church I was confirmed at, Holy Trinity Catholic Parish, Oconto, WI.